Audio Description can be ordered either as part of the upload process or after a file has been completed. Follow the steps below to order Audio Description for a completed 3Play Media file that was created using the English transcription and captioning service, the English transcript alignment service, or the Captions Import Service. Please note though that if the file was created by using the Captions Import Service, that the ability to order AD for the imported file will only be possible only once a source video has been added. Prior to ordering audio description first check your Audio Description Settings and Audio Description Cheat Sheet. Follow the steps below to order audio description for a completed file. Select the file for which you would like to order audio description from the My Files page and click into the file. Click the Order button located above the transcript preview window. From Order drop-down menu select Audio Description. On the Order menu a Suggested Service Level will display in this section of the menu. Use the Suggested Service Level to inform which service option is best-suited for the selected file . From the drop-down menu under Select Your Service Level choose either Standard or Extended. Click here to learn more about the Suggested Service Level. 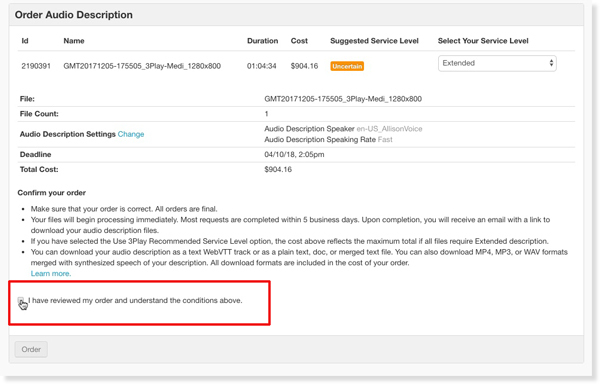 Please be aware that if we suggest Extended Audio Description for an order and you switch your Service Level to Standard Audio Description, you may run the risk of insufficient description given the available pauses in your video. Please review your video before changing the Service Level from Extended to Standard. The current Audio Description Settings for your 3Play Media project will display on the Order menu. If different Audio Description Settings are desired for this order click Change and the Audio Description Settings page will open in a new window. Choose the desired settings and click Save. Close the page with the Audio Description Settings and refresh the Order menu. The Audio Description Settings should update to reflect any changes made. Review the order and note the delivery date, cost, service type, and settings for this order. After you have reviewed your order, check the box at the bottom of the menu to confirm that this order has been reviewed and that the conditions from this page are understood. Click Order to submit the request for audio description.